The ThumbsUp! 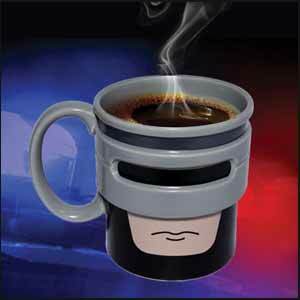 Robocup is a well designed ceramic mug that is very pleasing on the eye. 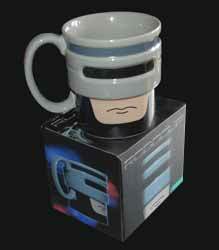 It's an essential drinking vessel for anyone who is a Robocop nut. The mug measures 9.3 cm in diameter and 10 cm in height and will hold quite a large volume of your favourite beverage. This isn't a mug for those who like to raise their little finger while delicately sipping their drink of choice, no this is a butch, no-nonsense mug that will put hairs on your chest... Okay, it won't. I may be milking this a bit too much. There's not much more to say other than this is a well manufactured, strong and detailed mug that is worth adding to your collection.